The Fujitsu Siemens Esprimo Mobile V5505 (£480 inc. VAT) is the company's latest entry-level machine aimed at the small business rather than the consumer. The chassis has an uncluttered design that uses plastic throughout. This makes it fairly robust and light. The lid has sufficient padding and there was little give, so it will comfortably protect the laptop's screen during transit. Open the lid and you'll find a 15.4-inch TFT display. It has a decent resolution, and the lack of a reflective coating means it can be viewed outdoors. The panel uses an integrated graphics chip, so you won't be able to run games or high-end applications, but for average tasks, including watching DVDs, it was more than acceptable. Weighing in at 2.7kg, this isn't a machine for the daily commute. Rather, it is intended to be used as a budget desktop replacement. With this is mind, it is fitted with an Intel Core 2 Duo processor. The T5250 chip is a budget processor, so the Windows Vista Business operating system doens't load as quickly or as smoothly as we would have liked. However, this is largely due to the use of only 1024MB of memory. If your budget allows, we'd suggest opting for 2048MB, as this will help improve performance. While designed for regular mobile use, we managed to record a battery life, under test, of 173 minutes, which is more than acceptable when you consider this was in High Performance mode. If you place the laptop in Power Saver mode, you can easily expect a further 30 minutes. The keyboard is of a good size. The keys feel a little loose when typing, but you'll quickly grow accustomed to the rather soft action. At this price point, the Esprimo isn't fitted with too many extras, but the essentials are covered. You'll find four USB ports scattered around the body, as well as a 54mm ExpressCard slot and memory card reader. When it comes to connecting to networks, the latest 802.11n is supported and you'll also find Gigabit Ethernet as standard. When it came to using the Esprimo out and about, we found it a highly versatile machine. While not the most powerful, the battery life means you can use it for long periods without having to worry about recharging the battery. The Fujitsu Siemens Esprimo Mobile V5505 isn't the most accomplished laptop and won't suit users looking for plenty of features. 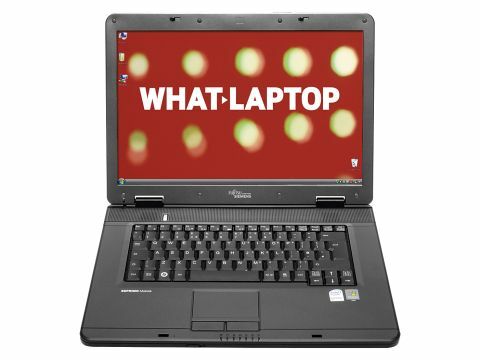 However, if you're looking to supply staff with a basic, all-rounder, this laptop has a lot to offer.